COMPASSIONATE CLIMATE ACTION: A New Ultimate Sacrifice? Last Sunday, I didn't remember (ahem) until after I'd blogged that it was Remembrance Day here in Canada: the 11th hour of the 11th day of the 11th month. So it wasn't until later that morning, after watching a ceremony on a friend's honkin' huge wide-screen TV, that something struck me. Well, a few things, actually. First, what is it that made it so "easy" to go off to war? (Young men were signing up all over the place back in the days of WWI and WWII, it seems.) How did governments and armies make it so enticing to leave home and loved ones to go and fight? Why are we not willing to make similaresque sacrifices today? And why is fighting for freedom so alluring, but fighting for survival a big nothing? Next, what would "the ultimate sacrifice" look like today? Is it the loss of peace of mind of parents everywhere, who must now worry that their children don't have a viable future? Is it all the losses already incurred by people in small island states, or the grain belts of America and Russia? Is it the deaths of people in the Caribbean and the eastern US seaboard due to Hurricane/Tropical Storm Sandy? Is it the loss of 400,000 people every year due to climate chaos? And finally, I was quite struck, as the representatives of different "forces" were laying wreaths at the cenotaph, how many hierarchical organizations we have in our culture, apart from the armed forces. Police officers, fire fighters, St. John's Ambulance, even Boy Scouts and Girl Guides. I suppose when you're asking people to put their lives on the line (okay, maybe not the Boy Scouts and Girl Guides, but who knows, maybe their original purpose was to prepare boys and girls for war), you have to train them in order to trust them. You have to train them to respect the commands of their superiors so that when fear would normally induce flight, these people stay and fight. I'm wondering why we aren't calling on all the people who have no choice (besides insubordination and mutiny), who have to listen to and obey their superiors, to fight climate change? Why aren't their superiors seeing the risks of climate catastrophe? Why aren't we drafting an army to fight this enemy? 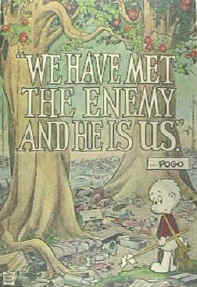 Ah, Pogo: "We have met the enemy and he is us." That would explain it. How do we fight ourselves? Perhaps this is where the compassion comes in. Our Canadian prime minister attended a Remembrance Day ceremony in Hong Kong at the Sai Wan Bay War Cemetery. He said, "By their deaths, they made possible the freedom we enjoy, the democracy by which we govern ourselves, and the justice under which we live." Prime Minister Harper doesn't tend to listen to his own words, but they're a good reminder that everything we now take for granted, everything that our veterans fought for — freedom, democracy, justice — is threatened by the climate change emergency, which is threatening the very survival of our species. I guess we could call that the new ultimate sacrifice.